- Drago Knight! is the 4th S Booster Set released in the Japanese and English formats. - Tons of new cards for popular decks! - Yuga, Subaru, Masato, and of course their arch nemesis, Ranma have all obtained various new powers! Their Buddies vastly enhanced! - Includes further support for Dragon World, Ancient World, Star Dragon World, and Lost World. - Introducing a new Attribute for Ancient World: Primitive Dragon. - Garga's New Deity ability arises! Optimize your trial deck with cards from this booster! Play your favorite Garga in a new style! - Each booster pack contains 5 random cards, one of them definitely R or greater. - When this card attacks, if its power is 10000 or greater, you gain 4 life! • Put a size 2 or greater monster from your drop zone into your hand. • [Counter] [Rest] a monster on your opponent’s field. - You may only cast this card if your life is 2 or more. - [Counter] Put up to two 《Dragod》 from your drop zone into your hand. Then, call up to one 《Dragod》 monster from your hand without paying its [Call Cost]. You may only cast "Gargantua Gate" once per turn. - This card on the field cannot be destroyed by your opponent's card effects. - When this card attacks, it its power is 10000 or greater, put the top two cards of your deck into your gauge, and you gain 2 life! - [Counter] 【Act】 When your opponent casts a spell, if you have a size 3 monster on your field, you may discard this card from your hand, pay 2 gauge, and pay 1 life. If you do, nullify the spell cast by your opponent. • Put the top three cards of your deck into your gauge, and you gain 1 life! • Destroy a monster on the field! - This card can attack even if you have a 《Primitive Dragon》 on your center. - If three or more 《Primitive Dragon》 monsters are on your field, this card gets power+10000, and critical+1! - Choose cards on your opponent's field up to the number of cards with (D Share) on your field. Destroy the chosen cards, and deal 1 damage to your opponent for each card destroyed!! - You may only cast this card during an attack on your opponent's turn, and if you do not have a monster on the center. - [Counter] Nullify the attack, and put up to one card from your drop zone into the soul of a 《Neodragon》 on your field. • For this turn, the next damage you take is reduced by 3. • If your opponent's cards attacked four times or more during this turn, for this turn, you will not take damage from attacks. 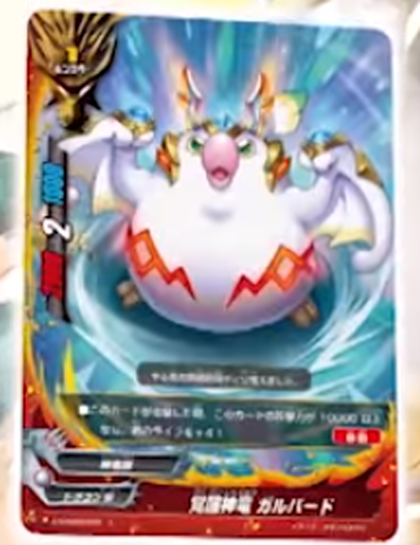 - If you have a 《Dragod》 on your field, this card's size on the field is reduced by 2. - Nullify all abilities of your opponent's monsters in battle with this card. This ability cannot be nullified. - "More Love" When a 《Dimension Dragon》 enters your field, you gain 1 life, and draw a card. "More Love" only activates once per turn. - If your flag is "Lost World" this card gets power+10000, defense+10000, critical+1, and [Double Attack]. - You may only cast this card if you have a card with <G•BOOST>on your field. - Look at the top three cards of your deck, put two from among them into your hand, and put the rest into your gauge. You may only cast "G•BOOST Over!" once per turn. - You cannot call monsters other than 《Primitive Dragon》. - This card's abilities on the field cannot be nullified, and its souls cannot be dropped by your opponent's card effects. - If you have another size 0 《Primitive Dragon》 on the field, this card on the field cannot be destroyed. - If you have three or more cards with (D Share) on your field, this card's attacks cannot be nullified if it is attacking alone. (D) When this card attacks and destroys your opponent's monster, [Stand] this card. • Put up to one size 3 《Primitive Dragon》 from your deck into your hand, and shuffle your deck. • If a size 3 《Primitive Dragon》 is on your field, put up to two size 0 《Primitive Dragon》 with different name from your deck into your hand, and shuffle your deck. - If you have an 《Astrodragon》 on your center, this card's size on your left or right is reduced by 3. - When your opponent's cards attack, if this card is on your left or right, change the target of the attack to this card. - At the start of your main phase, if this card is in your drop zone, you may pay 1 life. If you do, put this card from your drop zone to hand. - [Counter] 【Act】 During each player's attack phase, call this card from your hand. - When this card attacks alone, it attacks your opponent and all their monsters instead. - When this card is destroyed, destroy a card on your opponent's field. - When this card enters the field, you may drop a hand card. If you do, put the top card of your deck into your gauge, and put a card with <G•BOOST-Body-> from your deck into your hand, and shuffle your deck. - If you have a 《Dragod》 on your field, this card's attack cannot be nullified if it is attacking alone. • Put up to one 《Dimension Dragon》 item from your deck into your hand, and shuffle your deck. • [Counter] For this turn, 《Dimension Dragon》 monsters on your left and right cannot be destroyed. - Look at the top five cards of your deck, put up to two 《Primitive Dragon》 from among them into your hand, and put the rest into your gauge. You may only cast "YEAH！HIKARU☆" once per turn. - You may only cast this card if a size 3 《Primitive Dragon》 is on your field. - Draw two cards, and put this card into the soul of a 《Primitive Dragon》 monster on your field. You may only cast "IT'S SHOWTIME☆" once per turn. - You may only cast this card if you have an 《Astrodragon》 on your field. • Drop a soul from a card on your opponent's field, and destroy it. • For this turn, damage you take is reduced by 2. - [Counter] Choose and use one of the following two. You may only cast "Star Jack Revival" once per fight. • For this turn, all monsters with "Jackknife" in their card names on your field cannot be destroyed, or leave the field, by your opponent's cards. • Until the start of your opponent's next turn, you cannot lose the game. • Put a monster from your drop zone into your hand. • Choose a 《Lostvader》 on your field, and for this turn, your opponent cannot [Counter] during the battle that the chosen card is attacking alone. - Your opponent cannot call monsters by card effects. - [Counter] 【Act】 During an attack on your opponent's turn, you may pay 1 gauge. If you do, nullify the attack. - When this card enters the field, if you have a card with <G•BOOST> on your field, draw a card. - When this card attacks, if its power is 10000 or greater, you gain 1 life, and deal 1 damage to your opponent! • If you have a card with <G•BOOST-Body-> on your field, [Stand] a 《Deity Dragon Tribe》 on your field. • For this turn, the next damage you take from an attack is reduced to 0. - You may only cast this card if no monsters are on your center, and a 《Dragod》 monster is on your field. You may only cast this card if you have no monsters on your center, and you have a 《Dragod》 monster on your field. - Destroy all cards on your opponent's field five times!! Your opponent cannot [Counter] against this card. - You may only cast this card during your opponent's final phase. - [Counter] Put the top two cards of your deck into your gauge. Then, put up to one "Lost World" from your deck into your hand, and shuffle your deck! (D) If this card would leave the field, you may pay 1 gauge. If you do, it remains on the field. - This card cannot be called if "Primitive Giant Dragon, Big Bang Dragon" is not on your field, and can only be called to the right. - When this card attacks, deal 1 damage to your opponent! - This card cannot be called if "Primitive Giant Dragon, Big Bang Dragon" is not on your field, and can only be called to the left. - When this card attacks, destroy a card on your opponent's field. - Put up to one 《Astrodragon》 monster with "Cross" in its card name and up to one 《Astrodragon》 item from your deck into your hand, and shuffle your deck. You may only cast "Elegance of the Celestial" once per turn. - You may only cast this card if your opponent's life is 4 or less, and an 《Astrodragon》with "Cross" in its card name is on your center. - Deal 4 damage to your opponent!! This damage cannot be reduced. - Abilities of all cards on your field cannot be nullified by your opponent's card effects. - Nullify all abilities of your opponent's monsters in front of this card. - [Counter] You gain 3 life. Then, if you have a 《Lostvader》 on your field, you gain 5 life!!! -【Act】 You may [Rest] this card. If you do, put the top card of your deck into your gauge, and you gain 1 life! Then, if your flag is "Lost World", draw a card, and deal 1 damage to your opponent! - [Counter] Choose and use one of the following two. You may only cast "Origin Sky Dragon Spirit" once per turn. • [Stand] all 《Primitive Dragon》 on your field. • For this turn, all 《Primitive Dragon》 on your field get defense+5000, and [Counterattack]. - You may only cast this card if three or more 《Primitive Dragon》 monsters are on your field. - [Counter] [Rest] up to two cards on your opponent's field. -【Act】 Choose a 《Linkdragon Order》 in your drop zone, and a 《Linkdragon Order》 monster on your field, and you may pay 1 life. If you do, put the chosen card from the drop zone into the soul of a chosen card on your field. You may only use this ability once per turn. - This card can attack even if you have a 《Linkdragon Order》 on your center. (D) At the start of your opponent's attack phase, choose a card on your opponent's field, and for this turn, it gets power-3000, and critical-1! 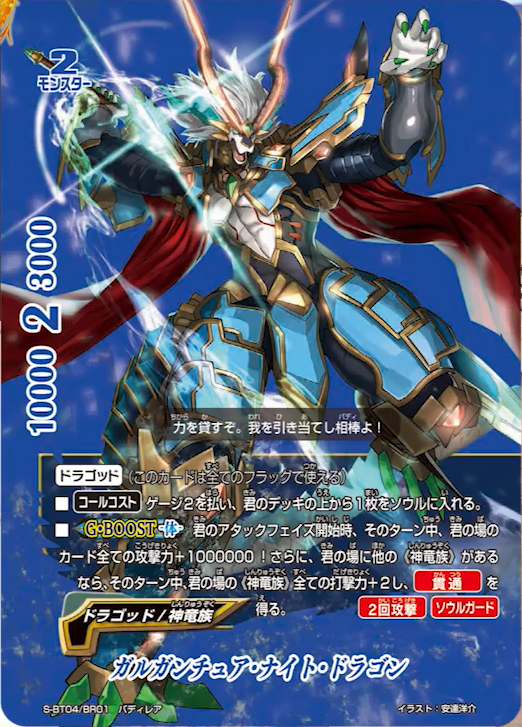 - All 《Dimension Dragon》 monster on your field cannot be destroyed, or returned to hand, by your opponent's card effects. - If your flag is "Lost World", this card gets power+10000, [Penetrate] and [Double Attack]. - If your flag is "Lost World", this card gets power+20000! - [Counter] 【Act】 If this card's power is 10000 or greater, [Stand] a 《Deity Dragon Tribe》 on your field. You may only use this ability once per turn. - When this card enters the field, choose a card on your opponent's field, and you may drop a 《Deity Dragon Tribe》 monster from your hand. If you do, destroy the chosen card. - At the end of the battle of this card, if its power is 10000 or greater, you may return this card from the field to hand. If you do, put the top card of your deck into your gauge, you gain 1 life, and draw a card. - Choose up to one 《Deity Dragon Tribe》 monster or impact from your drop zone, and put it into your hand. Then, if the chosen card is a 《Dragod》, put the top two cards of your deck into your gauge. You may only cast "Gar-E-Ang" once per turn. - You may only cast this card during an attack on your opponent's turn, and you have a 《Primitive Dragon》 on your field. - [Counter] Nullify the attack. Then, choose one of the cards that attacked, for this turn, the chosen card cannot [Stand]. - If a size 3 《Primitive Dragon》 is on your center, damage you take from your opponent's card effects is reduced by 3. 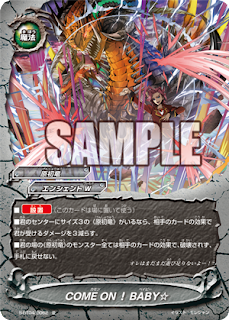 - All 《Primitive Dragon》 monster on your field cannot be destroyed, or returned to hand, by your opponent's card effects. - You may only cast this card if your opponent's life is 4 or less, and a 《Primitive Dragon》 is on your field. - Deal damage to your opponent equal to 1 plus the number of 《Primitive Dragon》 monster on your field. This damage cannot be reduced. <G•BOOST -Body-> At the start of your attack phase, for this turn, all cards on your field get power+1000000! Then, if you have another 《Deity Dragon Tribe》 on your field, for this turn, all 《Deity Dragon Tribe》 on your field get critical+2, and [Penetrate]. Secret / BR / SP / ???? - You may only cast this card if you have a card with <G•BOOST> on your field. - Destroy all cards on your opponent's field, you draw a card and deal 1 damage to your opponent for each card destroyed. - You may only cast this card if you have used <G•BOOST-Body-> during this turn. - [Counter] Put the top two cards of your deck into your gauge, and draw two cards. Then, you may call a 《Deity Dragon Tribe》 monster from your hand by paying its [Call Cost]. You may only cast "Gar-E-Burst" once per turn. 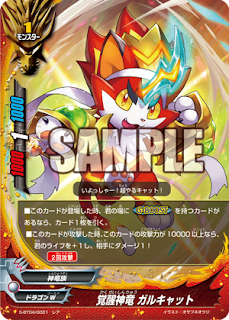 - If you have a 《Dragod》 on your field, this card and all 《Deity Dragon Tribe》 monster on the field cannot be destroyed, and their abilities cannot be nullified, by your opponent card effects. 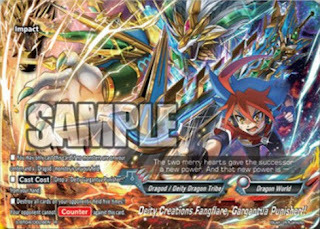 - [Counter] 【Act】 If you have a card with <G•BOOST-Body-> on your field, call up to one size 1 or less 《Deity Dragon Tribe》from your hand by paying its [Call Cost]. You may only use this ability once per turn. - You may only cast this card if your opponent's life is 5 or less, neither you nor your opponent has a monster on the center, and you have used <G•BOOST> during this turn. - Deal 5 damage to your opponent!! This card cannot be nullified, and its damage cannot be reduced. - <Galaxy F> If this card is on your center, all of the following abilities activate. 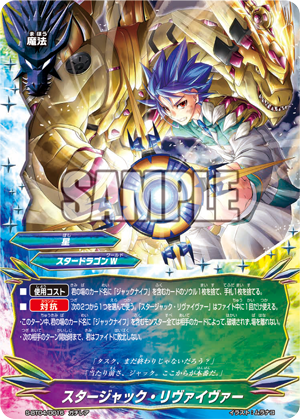 • If you have a 《Astrodragon》 on your left, this card and 《Astrodragon》 on your left get defense+10000! • If you have a 《Astrodragon》 on your right, this card and 《Astrodragon》 on your right get critical+2! • If you have an 《Astrodragon》 item equipped, this card and your item get power+10000! - This card can attack even if you have an 《Astrodragon》 on your center. - All 《Astrodragon》 monster on your field cannot be destroyed, or returned to hand, by your opponent's card effects. - If you have an 《Astrodragon》 on your left or right, this card gets critical+1! - [Counter] 【Act】 Call this card from your hand by paying its [Call Cost]. (Spiral D Share) This card gets all the (D) of (D Share) in its soul. - At the start of your attack phase, call up to one 《Linkdragon Order》 monster from your drop zone by paying its [Call Cost]. (D) When this card enters the field, for this turn, it gets [Penetrate] and [Double Attack]. - [Counter] Choose and use one of the following three. • Destroy up to two cards on your opponent's field. • Return up to two cards on your opponent's field to hand. • [Rest] up to two cards on your opponent's field. - You may only call "Vile Demonic Husk Deity Dragon, Vanity End Destroyer" once per fight. - When this card enters the field, put your entire deck into its soul face down. - You cannot lose the fight, this card on the field cannot have its abilities nullified and its souls dropped by your opponent's card effects. - "Dimension Gate -Desist-" At the start of each player's turn, put a soul from this card into your hand. - [Counter] 【Act】 During your turn, call a 《Lostvader》 from your hand on top of this card by paying its [Call Cost]. - If this card is in a monster's soul, it gets [Soulguard]. - If you have three or more 《Lostvader》 on your field, all cards on your field get critical+2, [Penetrate], and [Counterattack]. - At the start of your attack phase, for this turn, all 《Lostvader》 on your field get [Triple Attack]. - [Counter] Nullify the attack, and put one of the cards that attacked into the drop zone.